Superbowl Sunday is one of the biggest and most celebrated events in the US. Millions of people gather around the television with food and libations to watch the commercials, halftime show, and the best two teams of the NFL go head to head for the national championship title. Unless you are a true fan of the sport or your team is playing in the Superbowl, it’s really all about the food and the fellowship. Traditional party food for gatherings such as this is loaded with high amounts of calories, carbs, fats, sodium, and sugars. This year, I decided to throw a small Superbowl gathering amongst four friends and go beyond making the traditional calorie laden foods by creating healthier options using some of the fantastic food finds found in the Kroger’s Simple Truth Brand. Simple Truth has a variety of snack options and natural antibiotic free and organic meats that are nutrition friendly. For today’s party, I prepared sun dried tomato and cranberry chicken salad lettuce wraps using Simple Truth Natural Boneless Skinless Chicken Breasts and Kraft Mayo with Olive Oil, asian ginger pasta salad using Aldi’s LiveGfree Gluten Free Brown Rice Spaghetti, Simple Truth Organic Balsamic Vinaigrette, and other spices, fresh fruit, raw carrots, and Laughing Cow Creamy Swiss Garlic and Herb Cheese Wedges. For my snack items, I decided to try Simple Truth Organic Blue Corn Tortilla Chips, Simple Truth Organic Black Bean and Corn Salsa, Simple Truth Multigrain Rice Crackers, and Simple Truth Natural Fruit and Nut Mix. Eating traditional superbowl party food could easily add up to 4,000 calories or more for one meal/sitting which is beyond the FDA’s recommended daily value 2,000 calorie diet. Our recommendations if all is selected and eaten according to the serving size is less than 1,700 calories which isn’t too bad since this is a special occasion and you have a variety of snacks and foods to choose from. If diabetic, the brown rice spaghetti won’t spike your blood sugar up unlike semolina based pasta and our lettuce wraps are a perfect substitution for bread. It is also is gluten free for gluten sensitive readers. Each Simple Truth snack item was less than 150 calories, 20 carbs, 150mg of sodium, 8g of fat, and 9 sugars per serving and the laughing cow cheese was only 35 calories, 1.5g of fat, 190mg of sodium and less than 1g of sugar for one serving. 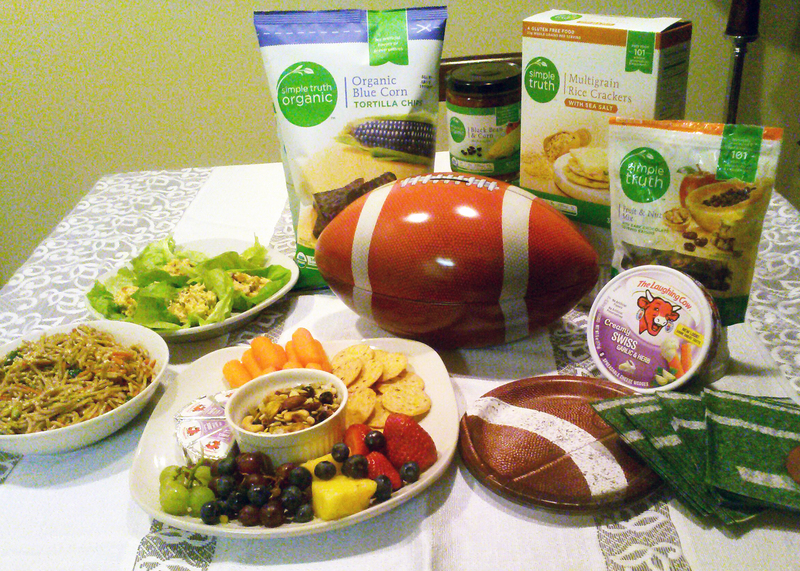 Superbowl Sunday can be a fun filled gathering with simple and delicious guilt free food without blowing all of your hard work from eating healthy during the week. Look for our chicken salad and pasta salad recipe under our appetizers, soups and salads, vegetarian menu or click on the above links. These snack items and appetizers can be prepared for any party, potluck, holiday gathering or as a part of your weekly meal calendar for lunch or as a quick and healthy snack. We hope you will like our appetizers and decide to give them and our fantastic food finds a try. You won’t regret the calories nor the taste. Previous postMaybe I’m Just Half Crazy! Next postLove is a Choice: I Choose Me.